On October 7th, 2010, David Malouf was awarded the John D. Criticos Prize for his book,Ransom. The awarding of the 2009 Criticos Prize to the celebrated Australian writer, David Malouf, was an occasion that blended high society glamour with a deep moral and literary seriousness. Held in Athens for the first time, amid the beautiful gardens of the Gennadius Library, it saw ambassadors and businessmen meet with novelists and scholars to celebrate the abiding influence upon modern literature of that earliest and most brilliant flowering of Hellenism: the Iliad. Malouf’s novel, Ransom, reprises the climax of Homer’s sanguinary epic, when Priam, the King of Troy, travels to see Achilles, deadliest of the Greek heroes, and the man who has killed his son, in the hope of redeeming the corpse. No wonder, then, bearing in mind such a theme, that all the talks given in honour of Malouf’s achievement should have been listened to with a particularly rapt attention: for the celebration was as much of Homer as it was of Malouf’s own brilliant novel. First, courtesy of Elizabeth Speller, Chair of the Prize’s Adjudicating Committee, we were given a round-up of the five books on the shortlist; then, thanks to Jeremy Newman, Australia’s Ambassador to Greece, a moving account of how Australians, although living on the far side of the world, have always identified with the heritage of Hellas. Colm Toibin, the great Irish novelist, gave a compelling and impassioned survey of the Homeric echoes that have repeatedly echoed throughout modern anglophone literature, and then, in the address of David Malouf himself, we were given a tour de force: a speech that combined moving personal reminiscences with searching cultural analysis. The two closing speeches, by Elizabeth Criticos-Foteinelli and Michael Moschos, served to remind everyone of just how fortunate both Greek Anglophiles and British Philhellenes are to have the Criticos Prize – and to whet the audience’s appetite for the literary riches that are doubtless to come next year. The ceremony was held in the presence of the Ambassadors of Australia, the U.K. and Ireland. A well-organised presentation of Greek-Australian writers publishing today in English — some in process of being translated into Greek such as Tsiolkas and Tsaloumas — added special interest for the Anglo-Hellenic audience. 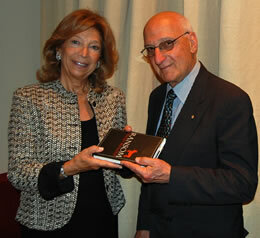 David George Joseph Malouf (born 20 March 1934) is an acclaimed Australian writer. He was awarded the Neustadt International Prize for Literature in 2000, his 1993 novel Remembering Babylon won the International IMPAC Dublin Literary Award in 1996, he won the inaugural Australia-Asia Literary Award in 2008, and he was shortlisted for the Booker Prize. Click on the links below to view internet articles on the 2009 award.